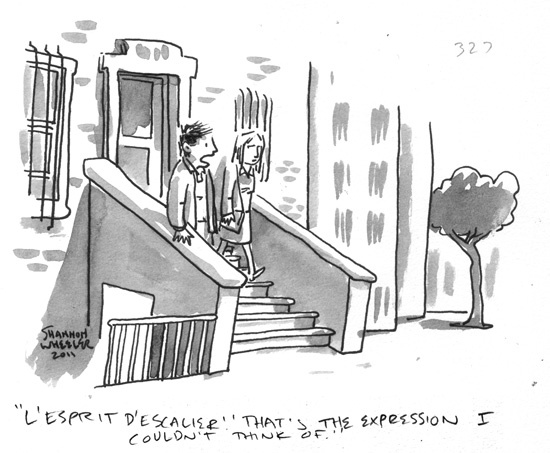 “L’esprit de l’escalier” is a French term used in English for the predicament of thinking of the perfect reply too late. During a dinner at the home of statesman Jacques Necker, a remark was made to Denis Diderot which left him speechless at the time, because, he explains, “a sensitive man, such as myself, overwhelmed by the argument levelled against him, becomes confused and can only think clearly again [when he reaches] the bottom of the stairs”. To have reached the bottom of the stairs, here, means to have left the gathering/conversation.